There is an open house today at Metro Hall for the John Street "pedestrian improvements". There's a new councillor, Joe Cressy, but the same old plan which gives all the space over to either cars or patios, leaving cyclists to a small space between the cars and the planters separating the patios from traffic. There is still no safe crossing of Queen Street between Spadina and University, which is incredible given the amount of bike traffic. There is still no other solution that works as well as John Street which is in essence being taken away from cyclists. Cyclists at Soho/Peter still have to make a jog to cross the streetcar tracks at an odd angle, a risky move for many. Urbane Cyclist is moving their store from John to Spadina. Is it possible that this decision was influenced by the lack of support by the City for this cycling route? It might have played a part. Why John Street is important to a downtown protected bike lane network: John is more direct, safer and more convenient than the alternative of Soho/Peter or any other. How for a brief moment cyclists accidentally had the most perfect protected bike lane. Until they installed the tables and chairs. Is there anything for cyclists in the John Street plan? : without bike lanes to help people of all ages and abilities keep separate from car traffic, John Street will be worse after the "pedestrianization". How City staff fudged the numbers to make cycling traffic appear inconsequential: City staff failed to count cyclists properly and inserted a fudged number of 2% at all times of day. Volunteers counting showed that the actual numbers can be as high as 30% of all traffic on John! Apparently Mountain Equipment Co-op is now moving to the northwest corner and it would be awesome if they were open to allowing a bike lane to go through their property. Or a compromise like that proposed by former Councillor Adam Vaughan where the corner is shaved to make the crossing more direct. Including a cycling path in a pedestrian area mostly benefits pedestrians. Bicycle parking, correction bicycle station, at the northeast corner? I think the John street project went too far ahead so adding bike lanes may not be practical at this point. Our best approach is probably working with Joe Cressy's office to place turn restriction signs for cars at strategic places to keep all non local vehicles off John. That street has never been designed for commuting anyway. We may get support on this initiative from the BIA and property owners - I don't think their customers want to seat on a patio enjoying exhaust from idling cars and trucks. Needless to say, bikes should be exempted from those turn restrictions. 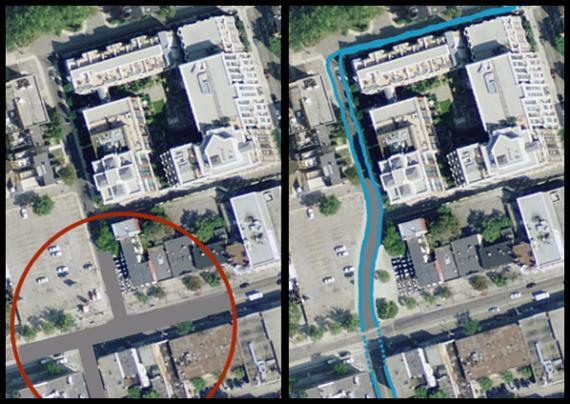 Banning turns to and from John may even improve traffic speeds on Richmond and Adelaide. Everyone wins. Yes -- limit access to John for cars. We want to make it hard for drivers to take John Street. I think they should also make John one way. I'm not sure if bike lanes will work if there is strong traffic calming on John—I tend to think we have to take a serious stab at one or the other—, but I know that they have to make space for cyclists and they have to reduce the number of motor vehicles on John. Right now the City's plan is half-assed and does next to nothing to make it hard for drivers to just fill up John with bumper to bumper motor vehicles. Yes, if motor vehicles volumes are low enough, then there's no need for specific cycling infrastructure. It becomes a traffic calmed "greenway". You cycle on the road. This is another option to propose. 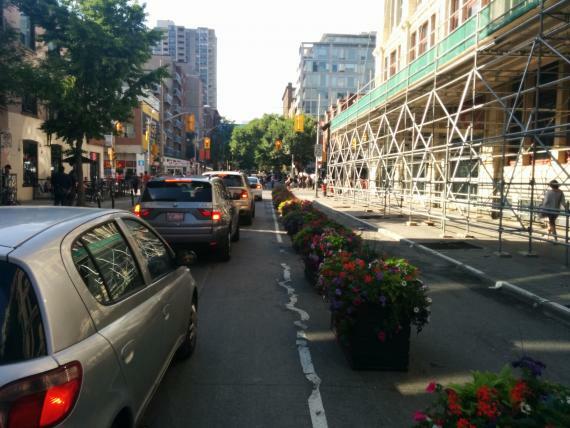 Peter Street is a completely unacceptable alternative for cyclists heading south on Beverly to east on Adelaide. Why would they go out of their way west one block then back east two blocks? This is the main north-south bike route in the west connecting to the main east-west bike route in the south. It's like our 427 & QEW interchange. I don't think their customers want to seat on a patio enjoying exhaust from idling cars and trucks. 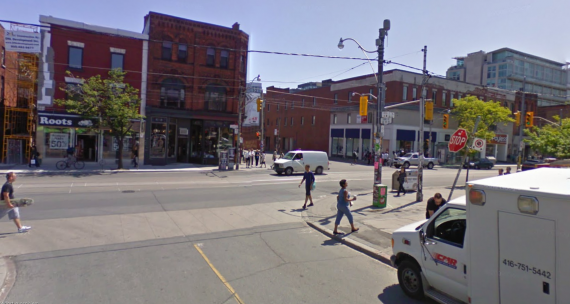 John St is cycling's 427/QEW interchange and it is outrageous that in a city that does so little for cycling the only safe place to cross Queen St West on a bicycle , is being taken away, to give patios to private economic interests Jack Astors etc.